Welcome to Chongun Haven the premier source of information on the Chongun subpath. Ever wonder just how involved racoons are in the changing of the seasons? Well Adieu set out to explain just that in her story The First Blossom of Spring. Hey we are having another summer points contest. This time the target is earning 2000 points within the month of June. Check out the June 2012 Points Contest page to keep up to date on how people are doing. Looks like the Poetry section was not displaying correctly. It's fixed now so if you need to get your daily fix of Chongun creativity go check it out. Just in time a new poem by Ellinia entitled A poem of the Chongunate has been added. I give you not one but two stories on the Chongun's ability to enhance drinks (yum). First is The Secret to the Mongol Conquest: Turning Water into Wine by Horace. Next is an untitled story by Lekgolo. A new section has been added to Chongun Works, it is the Kingdom History section. There you will find some retellings of important events in Nexus history from various Chonguns. Starting with the creation and development of The Ascendent Regiment of Nagnang written by Horace. As most of you probably know this site updates fairly regularly in terms of the roster, so even when there doesn't seem to be much happening on the news page the site is still chugging along. However news has been especially slow these days and there is a reason for that. The next version of Chongun Haven is well underway and should be completed sometime during this decade (maybe even this year). So that is where a lot of my time and energy is focused. Anything I do with the current site would have to be reproduced for the new one so I'm hesitant to add too much here. So be patient, changes, they are a comin. With all these new maps you would think we would at least have one of the Chongun area. While now we do thanks to Minnea. 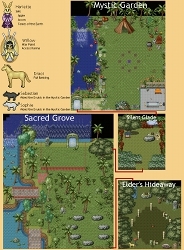 Minnea has contributed another map to the Maps section. This time it is the Do subpath area. Our newest bard Minnea has contributed two things to the Chongun Works section. 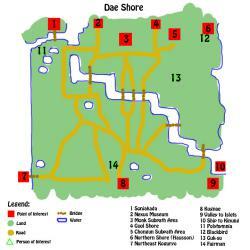 First up is a map of the Druid subpath area. A new section was created for Minnea's second contribution. Check out the Character Development section for Minneas advice on crafting a character history. Seems like not much is going on in the kingdoms lately but as a reminder of how creative us Chongun's can be here is a new map created by Aurore. This map and several others in different styles and formats can be found in the Maps section of Chongun Works. Take a look at Chongun Works for all the other cool stuff created by Chonguns. The event page for Battle of the Sonbae has been updated. Event pages have been added for Battle of the Generals and Samurang Showdown. As the title says the Jobs page has been updated. The update makes the page more accurately reflect the ingame description of jobs we use. No this is not a duplicate post from last month. The Chongunate really is running another tribute point contest for it's members to participate in. So Chonguns get hosting to win fabulous prizes. As for the rest of you, please come out and enjoy our events. The current standings for this event can be found here. The Chongunate is currently hosting a contest open to all Chonguns. We are looking to earn 150,000 tribute points for the month of May. The Chongun who earns the most tribute points will also be given the honor of choosing Guldar's next haircut. I almost let this change in the path slide by me. Who says Chongun Haven doesn't try to stay up to date! The joining/returning guidelines have been updated. So if you are seeking to join or rejoin the path be sure to give them a gander at the Guidelines page. These new rules are listed under 'Seeking to Join or Return'. Musadan's Maneuvers has been given an events page. There have been some changes and additions made to The Gauntlet event. The Weapon Statistic Analysis page has been updated with information on arrows courtesy of sweetling. The various problems I mentioned in my previous post have been fixed. Alrighty welcome to 2011 and to a slightly buggier Chongun Haven. Looking for stories/poems? You will not find them here at least for now. The Kwanhonsagje, Stories, Poetry, and Poetry Profiles pages are not working. Now explaining why this is allows me to get a little plug in for my other site. Nexus Biographies has finally been updated and remade. Since the sections I just mentioned rely on Nexus Biographies to provide content, they are not playing nice with the new version. I'll have this all sorted out soonish. Until then why not take a look at the Scrolls section of Nexus Biographies for all your Kwanhonsagje needs. Heck read about some of those other subpaths as well. You can also find stories by Chongun authors among many others on the Story section. So what marvels does 2011 hold for Chongun Haven? Well 2010 (the last half anyways) was the year of Nexus Biographies for me and... probably the first half of this one will be focused on that as well. However I gots plans for Chongun Haven. The Calendar has been updated with a bit more style. Art of War events have been given their own category so they stand out a bit more from regular community events. The August/September 2010 Points Contest is progressing nicely as we finish off week three. Throughout the contest the Current Standings page has constantly been updated with new new features. If you haven't checked out the current standings page lately, I encourage you to do so. People are now divided into five divisions reflecting their standing in the competition. Other stats have also been included on the page to help gauge the success of the contest. Although the contest standings page for our August 6 - September 10 points contest was working perfectly, it was also working perfectly slow. I have tweaked the page a bit and now it should load much faster. The Chongunate are hosting a points contest for all members from August 6 - September 10, details and current standings can be found here. KaptKaveMan and DeanWeen have been promoted to Master Duelist and Master Hunter respectively. For some reason (I forgot) the User Pages entry in the Guidelines section was not updated when our policy on sharing stats was changed. The entry has now been updated and to be perfectly clear all Chonguns are now allowed to share their stats in game and on their user page. If you find any errors on the site be sure to n-mail them to PyroAce. Excaliber has added his opinion on rogue subpaths in the Interpath Relations section. Deanween is the first to add his thoughts to the Hunting Strategies section. Both the Poetry Advice and Art of War sections in Chongun Works have been updated with new works from Excaliber. These focus on the use of imagery in poetry and the effect chapter 1 of the Art of War has on daily Chongun life. Some sort of anti-leeching policy may be enacted in the future. Contact Guldar with your thoughts on the matter. About a week or so ago we changed around our point awards for those involved in events. The new values can be found on the Points page. Now we are just gettin fancy. A new calendar is available on Chongun Haven to keep you all up to date on the happenings in the path. Check out the Calendar today! Or just look below. I said I would try and post news on changes made to the site and I am a man of my word! First the Chongun Pardon Tribunal event page has been updated to include the new tribunal Community Events post. Hopefully this new post will make the whole process a lot clearer for those seeking pardons. Also in the tribunal department, congratulations to Itoi on becoming the latest Tribunal Coordinator. He is the fella you should be sending your tribunal requests to. The Organizing an Event page has been updated to reflect a small change. From now on approval forms should be sent to PyroAce. Although you probably can't tell from this news page, the Chongun subpath is always on the move! Congratulations to Itoi and Boomer on their promotions to guide. As always I would like to remind everyone that despite the inactivity of this news page, the site is constantly being updated. Our roster and everything that goes along with it is always up to date. Information pages are also updated accordingly whenever changes are made in the path. So do not be afraid to use the site as a resource for all things Chongun! For my New Years resolution (what it's March 29 already!?) I will try to post on the news when any big changes are made to the site. The Kwanhonsagje and Stories sections have been updated to reflect the restructioning of the Kwanhonsagje. The Kwanhonsagje has been divided into two 'editions'. First is the standard edition which is exactly the same as the Kwanhonsagje found in-game. Knowledge of this edition is required by all Chonguns, and it's contents are considred applicable to every member of the Chongunate. The extended edition contains material removed from the Kwanonsagje which is still considered useful for helping Chonguns expand their role-play. Content in the extended edition is not required knowledge and is not used to shape the behaviour of all Chonguns. For instance the Textbook of Knightly Conduct is not a binding document on the actions of all Chonguns. Content that was believed to have no place in either the Standard or Extended edition of the Kwanhonsagje has been moved to the stories section in Chongun Works. The new item system should be cleanly integrated into Chongun Haven now. So if you check your profile you'll be able to mouse over the various items to display a message about whether or not you are able to purchase an item. Of course not everything was thought of when this new system was implemented. Due to a few problems all new item purchases are on hold. Should be cleared up by next week. Although we bid good-bye to the ranking system it is not forgotten. Information on ranks has found a new home in Chongun Works. So if you are feeling up for a lesson on history be sure to take a look there. Since we no longer use ranks it is unnecessary to keep that information displayed on roster pages. So now only Cadets will have their 'rank' displayed. As I mentioned in my previous post the Chongunate are planning to rid themselves of a ranking system. The new system has now been put in place. Check out the Item Distribution System sub-section of the Points section for more info. Please note that you will need to refresh your browser for the new roster filters to work. Not to much happening with the site lately. The path itself is going through some changes as SilentS has once again been ascended to Elder. 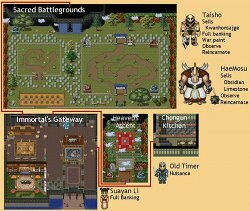 The community areas of the Chongunate have been shaken up quite a bit with new designs for the Sacred Battlegrounds, Immortals Gateway, and the Chongun Kitchen. In regards to the title of this post the roster has been updated to include new filters. Namely the rank filters have been removed and replaced with item filters. What this means is you can now search Chonguns based on the items they have forged. So why the removal of ranks and the sudden focus on items? Well it's reflective of what the path is going through now. We are currently in the process of doing away with the rank system and going to a purely item based system. Another change in the path is the reorganization of the Kwanhonsagje. The scroll is now focused purely on subjects and events that every Chongun should know, no exceptions. Because of the diversity in role-play between every Chongun the Kwanhonsagje was a mixed up. Don't worry this change is not meant to restrict individualality in the Chongunate, merely to focus the path as a whole. You can still play the knight or soldier or paladin or whatever but they are no longer mentioned in the Kwanhonsagje. With this change to the Kwanhonsagje, the online Kwanhonsagje on this site is a bit out of date. It will soon be updated to reflect the in-game Kwanhonsagje. It is worth noting that nothing in the in-game Kwanhonsagje is not on this site, we just got a couple extra articles. So the site will be updated to accurately reflect the Kwanhonsagje. What does this mean for stories that were removed from the Kwanhonsagje? They will be moved to appropriate sections of the site (mostly to the Chongun Works section). The former Creativity menu has been rebranded Chongun Works. Instead of just housing stories and poems created by Chonguns, Chongun Works will contain all Chongun generated content. This comes in the form of things such as poetry or dueling advice. A major part of Chongun Works is based on completed Job Challenges, so now when you complete a challenge you do not have to worry about it ever disappearing. The Activity Stats section was updated some time ago to include information on events submitted through Chongun Haven. I have extend this feature to individual user cards. Simply click the Activity link under any card and then click 'Show Events' under the month you are interested in. This will show all events that Chongun has participated in during that month. Of course this feature is limited to the time since this data has been collected which was the beginning of June 2009. For the moment name suggestions have been removed from the site. Those were the suggestions that popped up as you typed something into the search field under the Roster menu. It is possible this feature has been causing problems for some users including myself. I am not sure if it will return in the future. I am currently unable to connect to Chongun Haven. I am unsure if this issue is effecting anyone else but I know it is not widespread. If you have any troubles with the site please contact PyroAce but keep in mind that I will be unable to fix problems for now. The Activity Stats section has been fixed up a bit for Internet Explorer and Opera users. There are still some errors though. IE has trouble placing some of the extended stats properly and Opera does not display them at all. These bugs will eventually be fixed but for now people will have to live without them. The Activity Stats section has been updated again. This update makes the graphs a little bigger and shows a clearer relationship of stats from month to month. By hovering your mouse over you any bar you will also be treated to some additional stats such as changes year over year or from month to month. Unfortunately this new feature does not seem to work in Opera or Internet Explorer browsers. The issue should be fixed very soon but if you use one of those browsers you may want to avoid this section for awhile. The Activity Stats section has been updated to include information on submitted events during individual months. This feature only applies to months from June 2009 onword. Busy day today. With the recent crop of updates it seems as though Internet Explorer got left in the dust a little bit. I have managed to squash any bugs I could find with Internet Explorer however if you encounter bugs (on any browser) please contact PyroAce. The first bug was one I was fully aware of and just did not have the time to get too. As I mentioned in a previous post the new Job functions in the stats sections would not work with Internet Explorer. I have managed to get them up and in working order now. A very serious bug appeared today which sometimes rendered the site navigation completely useless in Internet Explorer. Since it did not happen all the time I hope the bug has not been around for long and scared all them IE users away. I seem to have fixed it but if not please contact PyroAce. There was also an issue both getting to individual activity stats from profile pages and the look of those stats. The activity stats for individual Chonguns should work now and look a little better. I did not plan to make any updates to the Roster with my latest creative influx. However well looking over some other things I noticed that it was getting kind of ugly. For some reason peoples names were not centering very nicely under their pictures. I fixed the problem and along the way gave the roster a slightly cleaner look especially for people with longer names. Since I made the Stats sections much cleaner and nicer looking the activity stats on individual profiles were starting to look a little dingy. After a little bit of work they should look much nicer. They can still get a little tough to read for overachievers who excel in one month but crash in the next. Despite this they should be noticably improved. Both the Points and Events Stat sections have been updated to include information on Jobs. You can look at how people are doing across all jobs or focus on a particular job. These new features will make it even easier to find those suitable for master positions in any particular job. For any Chonguns not already involved in the Job System I encourage you to read up on it here. It is a great way to earn points and help out the path. Anyone from Cadet to Avatar can easily become an apprentice in any job by just talking to PyroAce. Keep an eye out on Chongun Haven over the next month or so as I have several changes that I am looking forward to implementing soon. As always do not forget the site is constantly updating itself so even when this News page gets a little bare the site is moving along. The Chongunate is not nearly as slow going as one might think from this site's news. A number of exciting changes have happened in the path since I last bothered to post. Pyroflames and Senti were promoted to Magistrates (guides). The Job System was updated to include Job Challenges as means for Chonguns to earn points without doing events. Finally the subect of this post, ranks, have been changed significantly. As evidenced by the information page on ranks we no longer base promotion decisions on just points. Time since your last promotion, points, and your peers opinions are all being put into consideration now. In addition the trials necessary to be promoted have been changed. This new system has been in place for a few months now but finally is reflected in the pages of this site so no more people get confused. Despite the rare occasion were information becomes outdated I hope that everyone continues to trust Chongun Haven as a reliable means of learning about the path without messing around with the path boards or the Kwanhonsagje. If you have any issues with the site please do not hesitate to n-mail PyroAce. A few guides have stepped down over the past few weeks and kinda messed with the Stats section of the site. Since guides are often used as 'experiments' they are not included in the Stats section because they are usually a little messed up. Anyways a few things have been adjusted and the stat pages should display fine now. In other statistical related news some people may have noticed some new things being tracked on their profiles. These would be the Job and Job Points fields. The Job stat counts how many events you have participated in that relate to your job. The Job Points field counts how many points you have earned from your Job. I would also like to take a moment to remind everyone to refer to the Net Points stat if all you want to know is your spendable points. All the other numbers are just 'nice to know' and used to track activity in the path. Probably should have posted this earlier but meh. Heira has called a path meeting for February 10 to discuss some upcoming changes/votes. Of particular focus are changes to the rank/point systems and the ugly, noisy NPC in Immortal's Gateway. The Guidelines section has been updated to include information on joining/rejoining the Chongunate. A minor bug with the creed being all bold on that page has also been resolved. The Kwanhonsagje has also been updated. A short while ago under Liadriel's eldership the path voted on a few new additions to the Kwanhonsagje. These new additions are 'The Burning of the Creed', 'Battle of the Sonbae', 'Sorbus and Alnifolia', and 'Twelve Heavenly Generals'. It is also worth noting that technically niether the Chongun Creed (found here) or Textbook of Knightly Conduct are part of the Kwanhonsagje anymore. Many still follow the creed and the circumstances of it's removal are sketchy at best so it will remain on the site. Many don't like the Textbook but it was never really an officially enforced part of the Chongun role-play. It will also remain here for now. A new Chongun Avatar has been elected. Congratulations to Heira on her new position. Been awhile since I've updated the news on the site. There have been several changes both to this site and to the Chongunate. First let us touch on the chaos which has engulfed the Chongunate. About a month ago the Regent Liadriel was ascended to the rank of Avatar or Chongun Elder. With this change came hope of a new path for the Chongunate. It was clear this path would be controversal but many felt that if handled in the right way the change would be accepted and beneficial to all Chonguns. Yes it was hoped that changes proposed by Liadriel would be facilitated by the path. Instead changes were charged through with little support from the path and little chance to debate them before they were enacted. There are no innocent parties in this struggle. Some went to far in their protests, others remained silent when their voices were needed. Still we all remained Chonguns and desperatly searched for a solution. In the end it was to much and the archons stepped in to give everyone in the path a voice in the new leader of the path. These votes were rather mismanaged and caused quite a stir. A vote of no confidence was eventually held to expell Liadriel from elder. By a rather narrow margin Liadriel was defeated and the search for a new elder began. Unfortunately before the vote on a new elder came to fruition, Liadriel effectively disbanded the path save for a handful of people. it is a sad time when a player takes and removes other players from a path. this removes all karma, spells and time of those who pay to play their accounts. in the future any path who votes to have elder removed, will have elder removed from job at such time as elder is voted back in or not. we at KRU are aware of the issue and will be fixing each character that was removed. we do not need names because we have list of all removed this morning. we will reset you back so please do not use character today. trying to remove your items and give to other players will not effect this, so do not try to cheat system. we not dumb. we will try to fix all characters first thing monday morning and will announce when all characters done. please do not play that character till this is fixed. Now the path looks towards a new future beginning tommorrow. Better than the time before Liadriels eldership? Maybe. Different? Most certainly. The path clearly wants some form of change as evidenced by the support Liadriel received despite his methods. Each nomination for elder must carefully consider the will of the path and the direction we wish to go. The power to influence the path rests in the hands of who it belongs, the whole path. Let your passion shine through and guide us to a bright future. An exciting new change has happened in the Chongun path. This wednesday the job system was introduced to give Chonguns the opportunity to get more out of thier events and get more involved in training students. More info can be found in the Jobs section. The creativity section was not working previously and now it is. The roster RSS feed should be working now (found here). The roster itself was having some issues which have hopefully been worked out, please keep an eye out and n-mail PyroAce if anything is strange. There was a problem with the roster filters that should be resolved now. The Guidelines section has been updated to include the Chongun Oath. This oath must be taken by all Chonguns. My host decided to update their servers today which really did a number on the site. Particularly the roster, creativity, and kwanhonsagje sections. I'm hoping that any issues will resolve themselves within a day, if not I will fix them. For now you may want to avoid those sections as they will be an eyesore (the roster is still completely useable though). Small update today. The roster has been updated to include new ways to filter through it. You can now show Chonguns based on their san mark and their activity. The roster now properly displays nexus activity and san marks alongside user images. Alright I wasn't able to accomplish all I wanted to do this weekend but I did get most of the updates I wanted done. First of all roster images are now displayed in a whole new way. I won't bore you with the details but basically it makes them load faster. The most disappointing update for me is the addition of symbols to indicate your san mark and activity on the roster page. The reason this is disappointing is because currently the images look horrible and there really isn't a way for me to get around it. I think I'll have to reimplement this feature in a different form later. The roster filters have been fixed and updated. They now seperate results by guides and walkers. Finally the way points are displayed has been changed. People were unclear in the past about why their total spendable points weren't equal to thier monthly totals. This is because varios purchases a Chongun makes is not factored into the monthly totals. Points have now been sperated into Gross Points (the sum of your monthly totals), Adjustments (Total amount of purchases you made), and Net Points (your spendable points). Bit of a lull in the site lately as there haven't been many problems and no new feature ideas have popped in my head. However I did make two updates today. First of all you can now filter the roster guides. What I mean is that when you use the By Guide option you can see all the different Chonguns who were guided by a particular guide. Pretty neat and useful for you guides to keep track of people. The second update is much less interesting. The points stat page had a small bug on it when viewing stats by month. I've managed to resolve this problem. Well the site has been pretty active lately and I really haven't bothered posting updates. Anyways here's a small summary of updates that have happened over the past month. A stats section has been added. Under the stats menu you can look at either point stats or event stats. Point stats will let you see who has earned the most points over different periods of time. The event stats section does the same thing except it relys purely on the events people have attended. Speaking of events stats, in light of the recent fluctuation of Survive the Subak events, the Subak has been added to every Chonguns profile. Now your roster card will keep track of the number of these events you have went to. The roster has been updated to include links to update the profile images being used. This will hopefully help load times by ensuring that only up to date images are being used. Also the site has been generally upgraded stylisticly speaking. It should now look much better in Mac browsers as well as Internet Explorer. Some of these changes have also helped the roster pages load faster. That's about it, hopefully I won't be so lazy next time and actually post updates as they happen. Maybe. You can now use back and forward buttons on the navigation to list different items under each section. Survive the Subak has been added to the events section. It provides a very different experience then our other pk events so check it out. The menus have also been reformatted a little. Now under any section only five of it's subsections will be listed. Never fear though you can no navigate through the list of events with the small > buttons. I'll make images latter to make it look a little prettier. The site is currently undergoing some changes so expect some errors for now. Well the current events menu lasted long didn't it? I decided to put it in the main navigation and put it under the title of Upcoming Events. The new Current Events menu seems to have messed with the roster formating. It should be fixed sometime today. The event RSS feed has been fixed and can be found here. I'm afraid this could possibly be a temporary fix so we will have to wait and see. Also I no longer have to worry about explaining what RSS feeds are to people who don't use them because we now have a current events menu to the left. It'd still be easier to use the feed but if you can't be bothered to check it out then this is a great solution. Although I hate to link outside of the site I was forced to with this new feature. The links from the current event menu will take you to the Nexus boards to view the CE post. Hopefully in the future I will simply be able to display times beside the event titles. The title says it all. The Organizing an Event page has been updated to provide more current forms for hosting an event. The event feed is broken and I won't be able to fix it for awhile. I have been busy with some other things but don't worry I'll get to it. Words of Valor has been added to the events section. Please note that the site may be buggy tommorrow as I make some updates. As the title says I have made an RSS feed to keep track of Chongun events. It can be found here. For those of you who don't know what an RSS feed is I'll work on making a small FAQ later. In the meantime I've already provided info on RSS feeds at Nexus Biographies, just go to the help section. Please note that this feed is still in a testing phase so expect to see bugs and please n-mail PyroAce about them. The site has been invaded by millions of flags. The flag has been a symbol of the Chongun path for some time so it was the natural choice to use to spiffy up the site. All those lists you see around the site have been updated to have a small flag beside them instead of that boring dot. Quicklinks have also been updated to incorporate the flags. Finally (and it's about time) I've added a little loading icon so that you shiny happy people know the site is doing something when you click on a link. Information on the Sacred Battle has been added to the Events section. Alright so the site has been infused with content. The complete Kwanhonsagje is now available in the Information section along with information on ranks and events. There should be no dead links anymore, if you encounter one n-mail PyroAce. As far as content is concerned the site is done however there are a few features I wish to implement. First of all I'll be adding some sorta loading icon so you peoples know the site is actually doing something when you click a link ;). There have been a few updates in last month and a half. I haven't really felt the need to update the news since a lot of the stuff relates tot he guide section. First up I suppose would be our RSS feed. You can now subscribe to a feed which will keep you up to date on roster updates. Speaking of roster updates the roster now automatically updates itself along with the Nexus userlist. Other updates to the roster allow for guides to edit peoples whether by giving them items, modifing their points, or promoting them among many other things. Guides also have the ability to add aspirants to the roster which has already been taken advantage of. You can also now quickly search the roster. The roster section has been updated with the ability to filter through the list. So far you can swift through peoples by rank and their lack of a guide. Originally the No rank and No guide options were to be intended for guides only but why not keep it simple and allow others to use them. So what lies ahead? Well I'm first going to add the ability to quickly search for a Chongun in the roster and then it's time to move onto the guide section. The creativity section has been completed. I rather like how it turned out and am looking forward to making the script that makes it happen available to other subpath sites so they to can tie into the Nexus Biographies Archive. Well it took five days but the roster is finally done. Well almost, there's still some issues. In particular I'm a little annoyed by how many people don't have a userpage. Anyways I'll move on to bigger and better things umm Wednesday sounds like a good day. The site is going along great at the moment. I have finished up the events section pretty much. New events and such will undoubtably be added there at some time. Can't say I have any bugs to report on at the moment. Next I'm moving on to what will prove to be the most difficult part of the site, the roster (which I realized I had previosly spelt as rooster). This section will prove difficult for several reasons since I have to first build it, then add in things like ranks and such. I also have to make it extensible enough so that guides can freely edit it and such. The roster will do many things. First and foremost to the average user is that it is a gateway into the statistics of all Chonguns which will include point totals from community events, guide information, ranks etc. It will also provide an out of game method for guides to maintain an aspirant list, blacklist, and points list. Today marks a new beginning for Chongun Haven. Using the foundations of Nexus Biographies powered by Crystalline, this new site will strive to provide a pleasant user interface for those who want to learn more about the Chonguns. The site will eventually use the Tranquillity set of scripts and formats based on Crystalline.